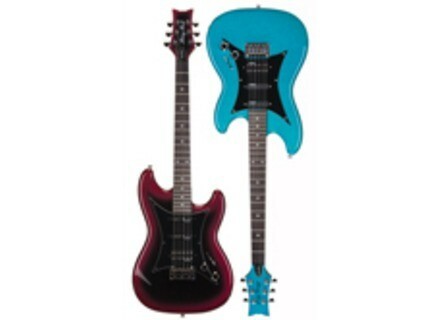 Rebel Rockit Supernova, Other Shape Guitar from Daisy Rock. Daisy Rock Girl Guitars continues to celebrate its 10-year anniversary with the arrival of seven new 2010 guitar models and finishes, including the redesigned Rebel Rockit Supernova electric guitars. The Rebel Rockit Supernova contains features including a 22 fret 24-3/4” “Slim & Narrow” rock maple neck—making it easier for girls with smaller hands to play—and a fixed bridge for more stable tuning. The light sycamore body is now 5% smaller, and the rosewood fingerboard featuring dot inlays sports a 9.5” radius to facilitate easier rhythm and lead playing. The Rebel Rockit Supernova is designed to offer comfort and style for females looking for a quality instrument with an elegant image. Available in Astral Blue and Black Cherry Burst finishes, the Rebel Rockit Supernova is now available at a retail price of $419 and a street price of $299. Visit daisyrock.com for more info. Fairfield Circuitry Four Eyes Crossover Fuzz This pedal features three parallel JFET fuzz circuits driven by a voltage controlled state variable filter with resonance control, mu-amp input stage and quite possibly, a wedgie. Heads Up Strap This strap features a pocket at the body end containing three lead weights, designed to balance the instrument. New Manne Models - May Manne has unveiled its selection of new models created in the last month.